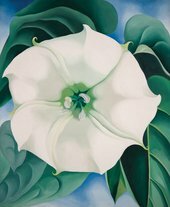 One of the highlights of the major Georgia O’Keeffe (1887-1986) retrospective opening at Tate Modern this summer will be the celebrated flower painting, Jimson Weed, White Flower No. 1 1932. One of the highlights of the major Georgia O’Keeffe (1887-1986) retrospective opening at Tate Modern this summer will be the celebrated flower painting, Jimson Weed/White Flower No. 1 1932. This iconic painting is an important example of the artist’s investigations into still life, and particularly the flowers for which she is most famous.